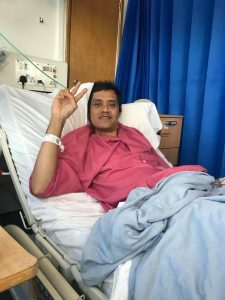 A maritime charity which is supporting a sick seafarer in Torbay Hospital is calling on people to send him their well wishes. Indonesian Mohammed Rosuli was hospitalised on Friday (25 January) after complications from an operation resulted in an infection. Sailors’ Society’s port chaplain Steve Loader, who is based in Bristol, visited Mohammed to keep his spirits up. Steve said, “He was quite anxious and alone and needed support and encouragement, so I made the trip to see him. Sailors’ Society’s CEO, Stuart Rivers, explained, “Seafarers like Mohammed can be away from home for many months. Seafarers are responsible for transporting 90 per cent of the goods used on a daily basis and are crucial to keeping trade flowing. Sailors’ Society has been bringing people together for more than 200 years, transforming the lives of seafarers and their families at home, in port and at sea through the delivery of chaplaincy, education and the relief of poverty and distress. The charity works internationally to provide practical, emotional and spiritual welfare support to the world’s 1.6m seafarers, regardless of background or faith. Sailors’ Society chaplains and ship visitors have a presence in 96 global ports, with wider projects and services covering 30 countries.